Today we’re again returning to the blog, Into the Foolishness of God by Shara Case. As happened in December, I got caught up in reading several articles here, and I encourage you to take several minutes to do the same. For today’s piece, click the title to read at source. It’s longer than usual, but is great reading. Paul and his team went about their business preaching and performing “unusual” miracles for two solid years in Ephesus. Diseases were healed, demons cast out, people were changed. It’s very interesting to note what Paul did when people didn’t agree with his teachings: “But when some were hardened and did not believe, but spoke evil of the Way before the multitude, he departed from them and withdrew the disciples, reasoning daily in the school of Tyrannus” (v9). It’s Monday and we have a bonus item for you by regular Thursday contributor Clarke Dixon. These notes are from a message that I got hear in person which was preached three times on Good Friday morning. But perhaps you are not a believer at this time? Then Christ crucified is a reality check in one more way: Check the blood spilled at the cross. This is an event in history. Christianity is not a religious philosophy or a set of rules for life. Christianity is about God revealing Himself to humanity over many occasions, but supremely though Jesus. His death was an event in history, as was his resurrection. Christianity did not have its beginnings, as many religions do, in a man teaching certain things about God and then trying to persuade people his ideas are correct. Christianity had its beginnings in the historical event of the life, teaching, death and resurrection of Jesus. Check the blood. Yes, this really happened. Look into it, and investigate it. Look into like journalist Lee Strobel who as an atheist came to trust Jesus as Lord and Saviour having investigated it with all his journalistic skills. Look into it, like J. Warner Wallace, who as an atheist came to trust in Jesus as Lord and Saviour having investigated it with his skills as a cold case detective. Look into it, like C.S. Lewis who described himself as the most reluctant convert in all of England, but who came to trust in Jesus as Saviour and Lord having investigated it with all his intellectual skills. And there are many stories like these. I hope your story will be similar. Do not become a Christian because you think it might be a good religion to practice. Trust in Jesus because Jesus died and rose again. Reality check. The events of Easter really did happen. Check the blood. You have a decision to make. The issue of following is just as relevant in the church today as it was in Paul’s day. All confessing Christians would affirm that they follow Christ but it isn’t that simple. Many take their instruction from others–pastors, teachers, or well-known authors. In fact, research shows that most do. Paul ran into the dilemma concerning believers selecting teachers when addressing the Corinthian church and castigated them for their attitudes. He wrote, “For when one says, ‘I follow Paul,’ and another, ‘I follow Apollos,’ are you not mere men?” (1 Cor 3:4 NIV) On looking back at that church, it is easy to be critical of their thinking, but the very same practice is rampant today. Many in Bible teaching can readily state the names of their favorite authors or speakers and take their instruction from them. The doctrinal positions within a church often reflect by proxy, the position of a favorite teacher. Paul found a problem with this and so should we. It was not Paul or Apollos who was to be the source of truth. Paul confessed to his readers that he had “planted the seed,” while Apollos watered and that each had been given his own task by God. The problem that exists, of course, is the discernment of the task given each person by God and how dedicated are they to it. Perhaps, the issue of discernment is the greatest challenge facing today’s church. There are a myriad of churches teaching a myriad of understandings; however, there is only one truth. The isolation of that truth is eternally important to each of us and Satan has been trying to confuse it from the beginning. If the Word is not being personally read and studied, those who claim the name of Christ, must be accepting as their truths the teachings of another. This practice can be dangerous. A number of years ago, a pastor told me, “We teach what we have been taught.” Is it no wonder that the church is weakening? “Believers” are not putting sufficient investment into establishing their own faith system. Pastors, teachers, and parishioners must be more discerning and more ready to challenge teachings that are in dissonance with their own reading of the Scriptures. Those who are being taught should not be intimidated by their instructors, regardless of their credentials. Believers in the twenty-first century are working with scriptures that have been translated many times and which have been placed in imperfect minds. The Lord still informs people, they need not rest the truths of faith in another. 1 Kings 13 relates the story of “a man of God” who had been sent to prophesy to evil king Jeroboam concerning his impending fate. The man of God had been told by God not to eat or drink in that place and to leave on a different route than taken upon arrival. Having given his message to the king the man of God left. Another man who claimed to be a prophet persuaded the man of God, since they were both prophets, to dine with him and although this was a lie he claimed that God had sent him. The man of God returned to the prophet’s house and enjoyed a good meal, whereupon the prophet relayed the death sentence that rested on the man of God for his disobedience. In the last days, many will be deceived. Consider this warning by Paul: “Do not be deceived: God cannot be mocked. A man reaps what he sows. The one who sows to please his sinful nature, from that nature will reap destruction; the one who sows to please the Spirit, from the Spirit will reap eternal life.” (Gal 6:7-8 NIV) How well does this passage conform to your understanding? What questions does it raise that need answering? There are many erroneous teachings in the Christian community as the presence of many denominations testifies. Christ said that he would teach you and remind you of his truths. This does not mean that pastors and teachers intentionally mislead; it means that we are to study and to let God teach us truth and righteous practices. If reliance is placed upon another, true discernment concerning the truth of his or her teaching should take place. Your eternal hope may very well rest in your diligence of study, meditation, and prayer. To default to another may reap destruction to your soul. Today we pay a return visit to Shane Idleman, founder and lead pastor of Westside Christian Fellowship in Lancaster, California, just North of Los Angeles. (And this time we looked into it and no, Shane and Kyle are not related!) To read this at source on the church blog, click the title below; there’s also a related article by him linked at the bottom. Church is boring, ​and many churches are dying ​because the power of God has vanished from the pulpit as well as the pew. Like Samson, they “know not that the Spirit of the Lord has departed” (cf. Judge 16:20). But there is hope if we once again seek God. “Light yourself on fire with passion and people will come from miles to watch you burn” (John Wesley). We need genuine revival preaching: “Revival preaching is more concerned about an outcome than an outline. The revival preacher is more aware of his text than the time. He is bent on pleasing the Lord rather than pleasing men. His ear is tuned to hear and heed the voice of God” (Harold Vaughan). “We need more prophets in our pulpits and less puppets” (Leonard Ravenhill). God’s call is not to Hollywood, Washington, or the media, but to us. If “My people” turn back to Me I will heal and restore. We have a form of microwave Christianity. Service times are cut to just over an hour, prayer is glanced over, and worship is designed to entertain the masses. “People are bored,” they say, “so our services need to be more appealing.” You can increase attendance with slick marketing and entertaining services, but you’ll miss the heart of God. The church will be a mile wide but only an inch deep. To seek in the context of 2 Chronicles 7:14 means to “find what is missing.” The Hebrew word for seek, baqash, has a very strong meaning. Imagine losing your child in a crowded mall. Your entire heart would be engaged. How would you spend your time? Where would your energy be concentrated? Now parallel this with seeking God. I’ve often said that one of the most difficult challenges associated with pastoring is not sermon preparation, leading a church, or taxing counseling appointments; it’s witnessing the tragic results of spiritual dehydration—watching people die spiritually with living water just steps away. Sadly, we are too busy and too self-absorbed to truly seek Him. In today’s culture, there are countless enticements that pull us away from God. It is my firm belief that, second only to salvation, seeking God is the most important aspect of the Christian life…to truly know God: “You will seek me and find me when you seek me with all your heart” (Jeremiah 29:13). Very few of us ever experience this close relationship with God because it involves things such as humility, dying to self, vibrant prayer, and heart-felt worship. This isn’t meant to discourage, but to convict. Conviction is a wonderful gift from God used to turn the heart back to Him. Let’s be honest: how many can truly say like Jeremiah, “His word is in my heart like a fire, a fire shut up in my bones. I am weary of holding it in; indeed, I cannot” (Jeremiah 20:9)? How many have truly experienced Jesus’ words in John 7:38, “Whoever believes in me, as the Scripture has said, out of his heart will flow rivers of living water?” How many can truly relate to “times of refreshing” found in Acts 3:19? This “way of escape” is ultimately what tilts the scale toward seeking God. When we flee temptation, turn from sin, and seek God, the by-product is the filling of the Spirit. The door of temptation swings both ways—you can enter or exit. If we choose to enter, once inside, we may not see the exit sign so clearly again. Shane Idleman is the founder and lead pastor of Westside Christian Fellowship in Lancaster, California, just North of Los Angeles. He recently released his 7th book, Desperate for More of God at shaneidleman.com. Related article by Shane: Why Do So Many People Hate Preachers? Related: A.W. Tozer quotation at Clark Bunch’s blog. One time when the kids were younger, for our Bible study we studied the story of Jonah for an entire week. Since by that point this was very familiar territory, we were looking for new insights into the story, and with scripture, you’ll always find them. We came up with a few, with a little help from the ESV Study Bible. There is a great deal of bigotry that plays into this story, but not in the way we often think. We tend to assume that Jonah simply didn’t like the people of Nineveh and simply didn’t want to go on that basis. But it’s more accurate to say that Jonah was afraid of the success of his mission. He certainly wasn’t seeing them through God’s eyes. Do we do that? What if that terrible family down the street become Christians and start going to our church? What if that guy where I work became a believer and started expecting me to mentor him in his faith journey? What if so-and-so in our extended family got serious about reading the Bible and started asking me why, if I’m also a Christ-follower, have I done some of the things I’ve done? What if those poor people I prayed with downtown and left my phone number expect us to help them out? What if all the people who put up their hands at the movie our church showed start coming ever week… there would be more of them than us? Everybody knows the terrible things that _____ did; now that he’s been a believer for two years, is he going to expect a leadership position? That’s the woman who hit our car in the hardware store parking lot last Christmas. What’s she doing at our small group meeting? The ESV Study describes the four chapters of Jonah as containing seven episodes, with the first three paralleling the second three. Jonah speaks to two similar audiences in the story. The crew on the boat heading for Tarshish were each praying to their own God, but then after Jonah explained to them what was causing the terrible storm, they prayed to Jonah’s God. Success! Just as he will experience in Nineveh. His ministry as a prophet was constantly bearing fruit. But inside the great fish, Jonah’s prayer is mostly thankfulness for his own safety and deliverance. There’s no mention of the sailors or the people who he was originally sent to. A rather egocentric prophet, don’t you think? Jonah shows up several days (or weeks) late for his assignment and delivers his message, albeit halfheartedly. Today we have preachers who read powerful scriptures and then deliver messages containing great truths — even if ‘borrowed’ from the internet — and yet don’t realize the power of the Word they are handling. It’s just a job. The people of Ninevah may matter to God but don’t matter to Jonah. He’s apparently quite disappointed that God doesn’t destroy the city. Perhaps that would be more fun to watch. Maybe God will destroy the city after all. He’s already changed his mind once. So instead of taking the first train, boat or great fish out of town, Jonah hangs around to see if anything develops. The closing phrase of the story shows how out-to-lunch his priorities are, as God’s final appeal is basically, “If I destroy the city, think of all the animals that would perish.” Since Jonah has a thing for houseplants, God figures he’ll appeal to Jonah’s sense of nature. Not a good ending for Jonah really. Final score: Ship passengers and crew – 1; People of Nineveh – 1; Jonah – 0. We ended our week reading the story from The Street Bible by Rob Lacey, known in North America as The Word on The Street. He devotes almost half of his writing to Chapter Four. Maybe someone should re-tell this story for kids, using the last chapter as the basis for the story, and then recreate the opening scenes backwards in light of the closing. Call it “Jonah and the Plant;” or “Jonah and the Worm.” Or instead of pitching this story for kids, it should really be part of Church Leadership Lessons 101. Often our evangelism efforts are focused on people who, if converted, will look like us and talk like us — people who blend into our local church culture — but the command of Jesus to go into the world means the whole world. This is our 4th visit to Created to Give God Glory, the blog of Baptist pastor Prentis McGoldrick. Click the title below to read this at source. Is Jesus Not Enough for Your Church? Churches are promising undeliverable enticements for people to visit. I heard one recently that promised that the people who visited would learn the purpose and meaning for their lives. Yes, it is possible to find that in Jesus Christ but no one can promise, no matter how hard they preach who Jesus is, that you will find purpose and meaning in one visit. I am afraid this is what the visitors believe will happen if they come. The local bar has a better chance of delivering their expectations. I noticed another church promising that those who come will receive a “dynamic” sermon. I’m not sure what that means. Surely, no preacher is trying to make his sermons boring. Most preachers don’t know if their sermons are boring. I know I don’t. I just notice the sleeping people. I conclude that the sermons are boring. Many churches are using marketing as their main draw for people to enter their churches. They are using “churchy” words and drawing in people from other churches who believe there must be something better than they have where they are. Then, these churches are crowing about their growth. Attendance and giving have become the main goals of the modern church. Any means of packing them in is okay. Jesus said that He would build His church. Jesus said He would build His church on the testimony of a faith in Him as the Christ. This is the foundation of the Church. Jesus said that the Father must draw people Himself before they can be reached. Is this why Paul was so determined to preach Jesus only? For the longest time I blamed myself for every person who left the church and praised myself for everyone who joined. I kept thinking that I had to grab their attention with more creative messages. I searched for videos to enhance messages, practiced what I would say and did my best to find amusing and emotional stories to hammer in my points. Even now, I don’t think these things are inherently wrong. They are only wrong when the message of Jesus takes a back seat to the efforts of man. Several months ago I began to pray to be filled with the Holy Spirit. I have recently gathered with others to pray that God would fill our church with His Spirit. I am neither testing nor challenging God to act. I am asking that He would build His church on the testimony of His Son. I am praying that our church turns the corner and becomes so Spirit filled that no one says that it was marketing, better preaching techniques or any other reason for what God will do. I don’t pray that our church is filled with people. I pray it is filled with Jesus. Personally, I believe He is enough. Before I start, I want to apologize for using a word in today’s title that is sometimes unavoidable. I was speaking with someone last week whose ministry involves dealing with skeptics and critics especially in reference to the subject of creation research. I was talking about how as children, we learn the ways of God through narrative, and referenced the stories of David & Goliath, Jonah & The Fish, Daniel & The Lions, The Three Men & The Furnace; and he quickly corrected me and said they try to avoid the use of the word story, because to some ears, that is equivalent to tale or myth. Rather, he said we should refer to the account of Jonah & The Great Fish, or the account of Daniel in the Lions’ Den, since this more clearly expresses the idea of a telling of something that actually happened. Having taken this advice to heart, when I sat down to type “Finding New Treasures in the Christmas Account” it seemed a bit awkward when compared to “Finding New Treasures in the Christmas Story.” So I apologize. Perhaps someone reading this who is dealing with a seeker, a skeptic, an atheist, an agnostic, or a new believer needed to hear this tangential story. Or account. …Last week at The Gospel Coalition there was an article for pastors by Illinois Pastor Steve Mathewson titled “6 Ways Not to Preach the Birth of Jesus.” Some of this is quite useful and if you’re in leadership, Christian education, youth ministry, children’s ministry, etc. I encourage you to click the link. I want us now to simply focus on what Steve wrote in his 5th point, because it reminds me of the depth and beauty of scripture; something that always fascinates me each time someone points out something new. 5. Avoiding the story of the slaughter of the innocents in Matthew 2:16–18. Like many pastors, I skipped this story for years. Yet when I first preached it 17 years ago, it stirred me to consider the hope we have in Christ. I also preached it on December 16, 2012—two days after the shooting at Sandy Hook Elementary School in Newtown, Connecticut. to hear the rest of the story: God will act to rescue and restore his people from the terrible situation. Matthew wants us to understand that the hope promised to the mothers who wept for their children taken to Babylon is the hope promised to the mothers in Bethlehem who lost their children—and to all who face horrendous evil and injustice. God will act to rescue and restore his people from the terrible situation. This is the message of hope that is the message of Christmas. The wonder of incarnation. Today, we pay a return visit to the Christward Collective website. When you are given the opportunity to deliver a sermon, there is no denying that an unusual adrenaline rush takes place. This probably happens to some degree in any public speaking situation. But in a church context, there is the additional rush (for lack of a better word) that you can experience as the Holy Spirit gives you things to say that weren’t in your written notes. Sadly however, the audience is often very passive. You see people yawning, or reading their bulletin, and wish that every person in the congregation could be as engaged as you. (That’s the dynamic of small group situations that many find so stimulating.) The author below paints a vivid picture of a church service where everyone is equally energized and in a sense part of the teaching taking place. Of particular interest here is a link at the bottom of the article. Don’t miss this. It’s to a book A Remedy for Wandering Thoughts in the Worship of God, published in 1835 and photographed for the archives of Princeton Theological Seminary. (Click the pages to turn.) If nothing else, read the table of contents to see the various aspects of the study the author made of this. Meanwhile, click the title below to read today’s thoughts at source. Some accuse the Protestant emphasis upon the preached Word as pastor-centric and non-engaging, but such an accusation assumes too little about the listener’s responsibility in corporate worship. Every individual in the congregation has responsibilities when the Word of God is preached. As we listen to the Word preached we want to aim at listening to it astutely, attentively, reverently, prayerfully, and responsively. Astutely: As listeners of the Word, we must insist upon the sound preaching of the Word. We dare not fall into the ways of those who have “itching ears” and accumulate for ourselves “teachers to suit our own passions” (2 Timothy 4:3). The temptation to do so is great and subtle. The Word is our nourishment, we live by “every word that comes from the mouth of God” (Matthew 4:4). Our souls and hearts will languish apart from “the whole counsel of God” (Acts 20:27). The pastor who enters the pulpit should not be able to satiate us with stories, jokes, wandering tales, or dispassionate reflections. We want to hear from God, so we will listen astutely for that living Word (Hebrews 4:12). Attentively: Our worship is never passive, but active as we engage with the Word preached. Of course, it is not our “laboring” that makes the Word preached effectual; that is the work of the Holy Spirit as He attends to the Word and works faith in the listener (John 3). But a disengaged and passive listener to the Word is no listener at all. As the preacher is accountable for what he says, so the congregation is accountable for its faithfulness in listening. Reverently: God is speaking to His people and so we are to receive that Word reverently. With the Psalmist, we would say, “Let me hear what God the Lord will speak” (Psalm 85:8). The most blessed of sermons occur when the listener begins to forget the preacher and finds their mind filled with the Word of God, their heart moved with love for Him, and their affections running after Him. We are on holy ground in worship and knowingly hang on the edge of our seats as we long to hear the next words from our Heavenly Father. He speaks and we listen. Prayerfully: The Spirit must attend to the Word, so we labor prayerfully in the pew as much as the preacher labors at preaching in the pulpit. Prayer paves the way for the Spirit’s effectual moving. We want our hearts to be fertile soil (Mark 4) for this eternal seed of truth. Even as our ears and mind our being stirred with the Word, so we are stirring our spirits in prayer. Responsively: As the Westminster Shorter Catechism states, “The Scriptures principally teach what man is to believe concerning God and what duty God requires of Man.” The Scriptures demand response: faith and obedience. We are to be “doers of the Word and not just hearers” (James 1:22). The fault lies with us if we emerge from a service asking, “Did you get anything out of that sermon?” Rather, we desire to respond with, “I will believe what God says and will obey Him.” The sermon will never be perfect, because the man preaching it is never perfect. Yet, if the text was read and the text was preached, there is always something for the listener to respond to. Searching our thoughts and lives for where the Word preached that morning is speaking needed truth in my life marks every faithful listener. We dare not excuse ourselves, focus on how much others need to hear this truth, or think we have heard this message too many times. None of us are perfect in any area of our Christian lives, we are all straining forward, pressing “on toward the goal for the prize of the upward call of God in Christ Jesus” (Philippians 3:14). Dear Christian, you may be sitting in corporate worship while the pastor is preaching, but this is no idle exercise. We are to be engaged with the Word. The little effect many sermons have upon listeners is less often due to the preacher’s lack of skill in preaching, but rather due to our lack of effort in listening. Listen astutely, attentively, reverently, prayerfully, and responsively. “He who has ears, let him hear” (Matthew 13:9). To read today’s article at source — where we’ve also poached a picture of Kevin preaching — click the title below. One of the greatest joys I had in the Philippines was teaching the Scriptures to students who had never really studied them before. I’d hand out copies of the New Testament and tell them the page number where they could find the passage we would study. It was the first time many of them had experienced a simple, verse-by-verse discussion of God’s word with someone willing to answer their questions. The same goes for my preaching ministry: I had to be careful about assuming my listeners knew anything about the text I would be sharing. This was particularly true in some of the evangelistic preaching opportunities God gave me. There was something extremely refreshing about doing ministry in this kind of setting. What an amazing privilege! This is not to say that Filipinos are Biblically illiterate –- there are thousands of faithful believers there who diligently study the Bible. But my ministry was focused more on those who were new to the faith. My ministry took an ironic turn here in the States. 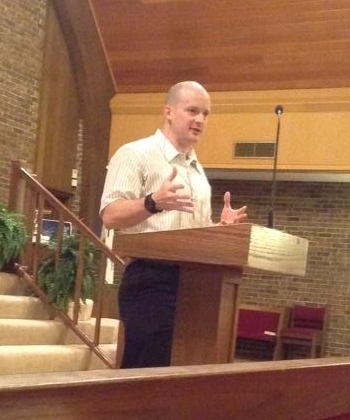 I’ve had the privilege of preaching (short-term) in three churches. All three congregations were of an older demographic: the average attendee had probably been listening to sermons since before I was born. “What can I share that they haven’t already heard many times before?” I asked myself this question as I embarked on this new season of ministry. God taught me something very important: I don’t have to teach/preach anything “new.” I’m not saying God lead me to “recycle” old sermon outlines from C.H. Spurgeon. Preaching, after all, is applying the timeless truths of Scripture to our modern context. But I realized that preaching is a ministry of reminding for many of us who have had already learned the basics doctrines of the faith. We are forgiven in Christ. The list goes on and on, but you get the idea. We need to constantly hear the gospel preached because we are a forgetful people. I’m thankful for the ministry of reminding–both as a preacher and hearer of God’s word. In the Bible prophecy does not refer to foretelling but rather to forthtelling. I remember as a young adult the first time my pastor referred to prophecy as “powerful preaching.” “No, no!” I wanted to scream, “It’s about being able to tell the future; being given supernatural knowledge to know what is going to happen next.” You see, I had been greatly influenced by the Charismatic movement and got caught up in the sensational and supernatural aspects of the gifts of the spirit; the signs; the wonders. I still consider myself a post-Charismatic. I still believe in the limitless power of the Holy Spirit. I believe that God indeed does give people insights into the future, but this is more through the gifts we call the word of knowledge and the word of wisdom; and even those are more concerned with seeing things as they are, not necessarily what will be. The gift of prophecy is in no way connected to the fortune tellers who occupy low-rent business locations and invite clients to learn where they are to live or whom they are to marry. It’s more about speaking plainly and in the power and authority that God gives to speak into a person’s life, or to a situation; and then to point them to Christ. Very seldom does the Lord God reveal a future event to us. The motivational gift of prophecy is primarily concerned with speaking forth the truth. The Word of God helps us to understand characteristics and avoid misunderstandings associated with the gift of prophecy, and it shows us how we use that gift when we walk in the Spirit. The apparent meaning is that those who have the testimony of Jesus—the angel, John and John’s brothers (fellow believers)—are all prophets. Prophets are bearers of the word of God, and in this book “the word of God” and “the testimony of Jesus” are inseparable (see 1:2, 9; 20:4). We learn now that the testimony of Jesus is not only a message about Jesus but also a message from Jesus the risen Lord. His is the one voice behind the many prophetic and angelic voices echoing through the pages of this book. So the testimony of Jesus is the spirit or essence of Christian prophecy. Whether it is also “the spirit of the prophecy,” referring to the book of Revelation itself (1:3; 22:7, 18-19), is more difficult to say (it does have the definite article in Greek). If it is, then the testimony of Jesus is virtually equivalent to the title “revelation of Jesus Christ” at the beginning of the book (1:1). Although I couldn’t find an exact quotation on this, I love how Canadian pastor Bruxy Cavey teaches on the times where Bible prophecy does involve looking into the future. He says that the point is not to look forward but after the events have come to pass to look back and realize that God had it all under his control all the time. God knew about it all along. In the meantime, the words of our mouths, and the meditations of our hearts should be all about testifying to Jesus. To Him be the honor, the power and the glory, both now and in the unknown future yet to come. Those of you who are in leadership at your church, or have done any preaching will appreciate today’s post, from our regular columnist, Rev. Clarke Dixon. Click the title to read this at source or respond directly with comments. Disasters: Divine Judgement? Reflections on Luke 13:1-5. Put yourself in the preacher’s shoes. There has been a natural disaster of extraordinary proportions in a nation whose sinfulness is well known. Do you stand up Sunday morning and declare that God has divinely judged that nation? Or put yourself in the pastor’s seat. The person sitting across from you has experienced a massive catastrophe and is lamenting that she must have committed a big sin to deserve it. Do you agree with her? Or do you reassure her that oftentimes bad things happen to good people? That is a very simple answer to what we sometimes make into a very convoluted question: “no.” When a part of the world experiences a natural disaster, ought we to say “ha, you have suffered more than we do because your sin is greater”? No. When a person we know (and likely don’t like considering our jump to being judgemental) experiences catastrophe, do we say “ha, you have suffered more than I have for you are bigger sinner than me”? No. When we suffer greatly should we assume that our own sinfulness must be overwhelming? No. Jesus was very clear in the two examples he gave that those who suffered greatly did not suffer more because they sinned more. So let us leave off that presumption. Jesus couldn’t be more clear on that. Let’s put ourselves back in the preacher’s shoes following a disaster. Perhaps you do not want to be one of those preachers that says something along the line of “this earthquake happened to these people because they practice voodoo,” and instead you speak on a different kind of line, a fault line along which earthquakes naturally occur. The people leave the church feeling quite reassured that God is nice, and the preacher too. But should a nation deeply into voodoo not repent from their voodoo anyway? Or you do not want to call America to repentance from corporate greed following a massive terrorist attack. But shouldn’t America repent of corporate greed if it is guilty of it anyway? We might tend to wince at the “loose cannon” preachers out there who jump all over every disaster as a sign of divine judgement, yet imagine what this world would be like if people actually listened to them and repented from sin? Imagine what would happen if every disaster were followed by waves of mass repentance. We would find ourselves living in a remarkably different world! Still wearing the shoes of a preacher, consider what would happen if every funeral service were not treated as a celebration of life for the deceased, but instead a call to repentance for the living? Every death, after all, is a reminder of our rebellion against God and the consequence of that. As a preacher your popularity would go down since people do not want preachers at funerals, but rather officiants. But if every attendee at every funeral were to consider the wages of sin, which is death (see Romans 6:23), and were to repent, the crime rate would fall, addictions would lose their power, sexually transmitted diseases would stop transmitting, broken relationships would be restored, marriages would regain health, and much, much more. We would find ourselves living in a remarkably different world! And best of all, billions of people would experience the grace of God for repentance is not just a turning away from sin but a turning toward God. Jesus could not be more clear on it: “unless you repent, you will perish.” That is the negative way of stating what is very, very positive: “For God so loved the world that he gave his only Son, so that everyone who believes in him may not perish but may have eternal life” (John 3:16 NRSV). Calamity and death have entered into this world because of rebellion against God. Bad things happen to all people. Yet out of the depths of His grace He saves us. He saves us for eternal life into the future, He saves us for Godly life lived through His Holy Spirit right now. If we see a nation or a person experiencing disaster, let us not judge. But neither let us hesitate to repent. In a blog titled Christianity 201, one assumes the story of the Prodigal Son in Luke 15 is somewhat familiar. If not, take the time to read it here. There you see two distinct audiences for Jesus’ story: Tax collectors and sinners — interesting distinction, don’t you think? — representing the younger brother in the story who returns to his father at the end to say, “I have sinned…” and Pharisees and teachers of the law represented the older brother in the story. Kyle even hints that finding a way to reach the hearts of that second group may have more to do with how the particular story was crafted. In many respects, this represents the two types of people who sit near us at any given weekend church service. If your church is doing it right; you’ve got people from the community who you and your fellow church members are inviting who are on the road to crossing the line of faith, or have recently come into fellowship and are seeing everything for the first time. Then, you’ve got what is probably a majority of people who have been in church since they were minus-nine months; the Sunday School teachers, choir/worship team members, committee members, ushers, elders, deacons, etc. Is every Sunday’s sermon a Prodigal Son type of story that bridges the two audiences? I can picture myself coming to your church and preaching this story and impressing everyone with how it reaches both types of people, but then what do the following week for an encore? I was first made to think about this when I had the privilege of hearing Keith Green in concert several times before his death in 1982. (Did I just give away my age?) Keith was one of the most spiritually focused Christian musicians I have ever encountered and he easily bridged the gap between two kinds of audience members by stressing the Lordship of Jesus Christ. God wants to cultivate within us a hunger and thirst for Him. The person who has been a Christ-follower for 40-years needs this just as much as the person who has been a Christian for 40 minutes. I believe it was Keith Green himself who pointed out that the word saviour occurs 37 times in the King James translation, while Lord appears 7836 times. That’s a ratio of nearly 212 to one. Our evangelistic and pre-evangelistic efforts are great as far as they go, but Christ’s intent is nothing less than that we make Him Lord over all our lives. Bringing our lives in subjection to him is something the Prodigal Son story teaches both to the younger brothers and older brothers in the crowd; the message cuts across both demographics. As I approached the end of the book, there were two brief things that also struck me that I wanted to share here. Those of us who have been in the church for awhile need to curb the tendencies to fall into older brother syndrome, because the demand for Lordship that Christ places on us is actually greater than that placed on those who are meeting Him for the first time.